Save up to 5% more. Responsive and fast, designed for all out speed an uninhibited acceleration. 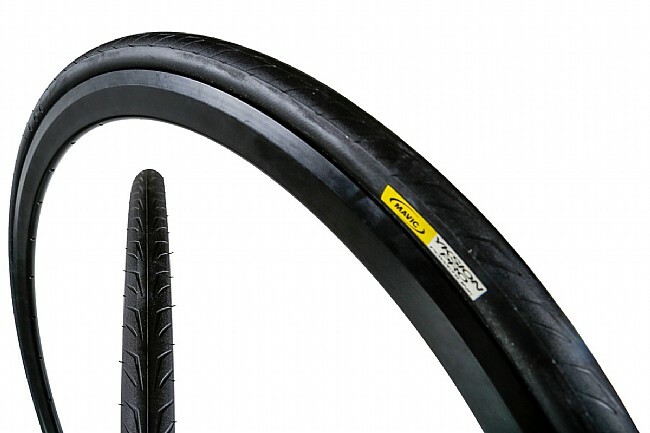 Mavic's Yksion Pro PowerLink tire has been specifically developed for rear use. The dual compound construction features a harder 70a rubber on in the center of tire to minimize rolling resistance. A softer 60a compound on the shoulders increases cornering control. The grooved tread helps displace water and further traction in wet condition. Mavic has also placed a Kevlar breaker beneath the tread to prevent punctures without adding necessary weight. The 127 TPI nylon casing further durability while delivering a dynamic ride quality. The Yksion Pro PowerLink Tire is available in 700c x 23mm (23-622 ISO) and 700c x 25mm (25-622 ISO). Folding bead. Claimed weight: 190 grams (23mm version). Black with White logos. Mavic has specifically optimized this tire to function as a set with the GripLink up front and the PowerLink tire on the rear wheel. I likes these tires as soon as I tried them. Supple, light, and long lasting - I use this for training and racing. This rivals GP 4000s on the rear. If WesternBikeWorks keeps the price low I'll buy more. Getting to many flats and very conscious of roadway. Not a bad tire. Not a great tire. Flats easily. I used these tires because they came mounted on a new set of wheels. Wear and traction were acceptable but not outstanding. The thing that set these apart was the frequency of flats. There's not much flat protection here compared to my usual tire - Conti 4000S II. Because of the flats, I took these off my next new set of Mavics before riding a mile on them. They just aren't worth the bother. I drove over 2000 miles on those and enjoyed the way they run and no problems with puncture. I mostly ride in dry climate. Tire blew out within 100 yards or first ride. It was a group ride and I was forced to miss the ride because of my new tires. Good ride quality and the wear has been good compared to some other top brands. traction has never been and issue. I picked up a new Cannondale EVO 6 and it came with Mavic rims & Yksion tires...I have been a road rider since the 70's and I ride upwards of 200 plus miles a week...Within the first three weeks I've had four flats, all of which where on the front tire...Every flat I could identify what caused the tire to go down...I've come to the conclusion that the performance of the tire is excellent but they are very flat prone. I have been riding Michelin Pro 4 endurance tires for several years on the same roads and have had zero issues to speak of. Nice and smooth and tough and fast. As a competitive rider I am constantly seeking out the latest and greatest components for my bikes with my latest purchase being a set of Mavic Ksyrium wheels and a matching set of Mavic Yksion, 700x23c (Power link and Grip link) tires. I was pretty much blown away by the performance of this wheel set and tire combo. I have ridden almost 3900 miles and these tire are still performing like new. The corning is quite impressive and energy transfer is first rate! If I had to by them again it would be a definite yes! I have put about 7k miles on these tires. They came with two sets of Mavic Wheels I bought. They don't roll as fast and are harsh riding compared to my benchmark the Conti GP4000. But I do find them as durable and flat resistant as the Conti. I replaced them with Conti's when they wore out at about 3500 miles. Not bad, just not great. Great club tire and training tire.